The Era, Saturday, 25th November, 1899. 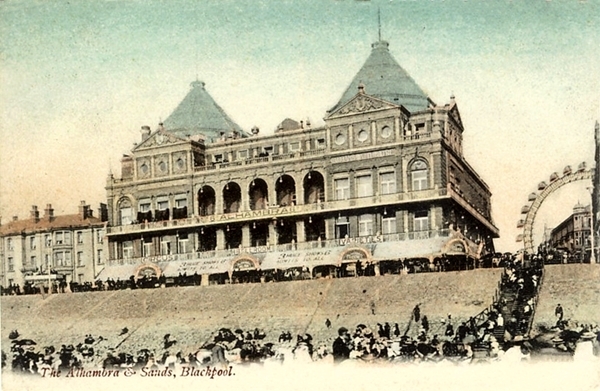 MR HARRY LUNDY, who was present at the Middlesex on Thursday night, is running that splendid hall, the Alhambra, Blackpool, through the winter—a proceeding that has astonished the townsfolk, as it is the first time such a thing has been known in the popular Lancashire seaside resort. This is looked upon as the worst month in the year, and yet Mr Lundy had no less than 2,600 people inside the building last Saturday. The experiment is a daring one, but it is entirely justified by its success, and shareholders are rejoicing. Mr Arthur Yates is again associated with Mr Lundy at Blackpool. 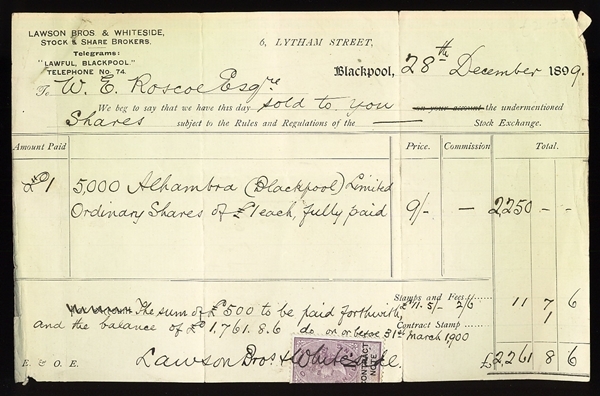 Receipt for purchase of 5,000 ordinary shares of £1 each in the Alhambra, Blackpool, in December 1899. 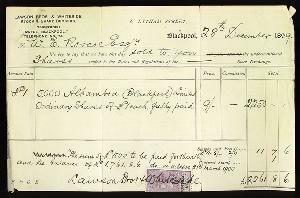 The £1 shares (20 shillings) purchased by W E Roscoe seem cheap at just 9 shillings each but the following year the shares were written down to 10 shillings. Click on the image to enlarge. The Leeds Mercury, Monday, 17th December, 1900. EXCITED SCENES AT SHAREHOLDERS MEETING. The annual meeting of the Blackpool Alhambra Company was held on Saturday. Mr. A. V. Haworth presided. The balance-sheet showed a total loss of £50,430. 0s.6.d. Mr. Howarth hoped their troubles were at an end. In July ruin absolutely stared them in the face and they had to split their connection with Mr. Lundy at a moment's notice. Mr. Lundy rose to ask the chairman to speak the truth, when an uproar ensued. Mr. Lundy, the chairman, and several others being on their feet at the same time.—The Chairman said he would have Mr. Lundy removed from the premises if he was not quiet. Mr. Lundy promised to be quiet and the chairman, proceeding with his statement, said Mr. Sykes joined the board, and he and the directors putting money down saved the company from liquidation. The company was now practically free from liability, and he predicted a successful future. The adoption of the report having been seconded. Mr. Lundy said it was perfectly untrue that the directors had to get rid of him. Prior to leaving he tendered his resignation twice because he did not believe in the methods of the gentlemen who had the control of the company. Continuing to speak at great length, Mr. Lundy was stopped by the chairman, who said the meeting had been called for business and not for private affairs. At a later stage the Chairman called Mr. Lundy to order, and in the disorder which followed the Chairman called four officials into the room to put Mr. Lundy out. This brought several shareholders to their feet, and howls of protest were heard from all parts of the meeting. The Chairman said he could not turn Mr.Lundy out of the meeting as a shareholder, but if he was disorderly he could do so. He asked Mr. Lundy to be quiet and that gentleman promising to do so the meeting proceeded. After further discussion a proposal was made that an investigation committee be appointed, but this was defeated. Mr. Howarth was re-elected as a director, and after some discussion it was decided to take ever the Hippodrome at £26,000. At an extraordinary meeting it was decided to reduce the ordinary share capital from £220,000 to £170,000 by reducing the value of the shares 10s. THE meeting of the shareholders on Saturday last was a most disorderly one. Mr Clement V. Haworth, managing director, took the chair, and, in moving the adoption of the report, which showed a loss on the year's working of £50,000, stated that the company had to get rid of Mr Harry Lundy —a remark that brought that gentleman to his feet with an indignant denial. Mr Haworth threatened to expel Mr Lundy, who, as a shareholder, was perfectly within his rights, and explained that he resigned his position because he did not believe in the methods of the gentlemen he bad to work with. When he was first engaged he was told that the capital of the company was £350,000, and that there was a good working balance, but instead of that the capital was £440,000. He saw nothing but trouble looming in the distance at the time, and now that be had left the company he dare not accept another position before he had explained his position to the shareholders, which was that of the poor little monkey who had to put its paws between the bars and take out the hot chestnuts for someone else. He had to do all the dirty work. MR LUNDY could not afford to have his character dragged through the mud. He was engaged for three years, and only stopped ten months. The company got into difficulties, and he raised £10,000 for them, although he was not financial manager, and he received £250 as his commission. When he left the company they entered an action against him, which cost him £38, and he eventually settled by paying £4.15s., which he admitted owing them. Mr Lundy suggested a committee of inquiry. Councillor Bridge, in his remarks, said Mr Haworth had talked " baby talk," and that it was all tommy-rot to say they had a prosperous career before them. 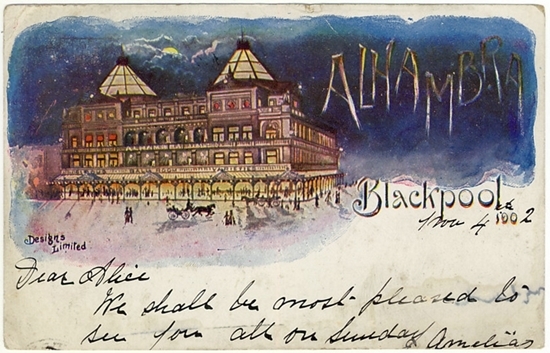 AT an extraordinary general meeting which followed, the chairman moved that the Alhambra, Blackpool Company do purchase the Hippodrome, Blackpool. The real cost of the Hippodrome was £21,000. The resolution was put and declared carried amid a scene of great disorder. Later, the reduction of the ordinary shares-100,000 at £1 each—to 10s. each was resolved upon. In either 1902 or 1903 the Alhambra building was purchased by the Blackpool Tower Company and it was renamed the Palace.